Weatheritup is an application that claims to be able to help you track the weather easily. It claims that it can provide the weather forecast of any location and you will not even need to leave the page that you are viewing in order to check it. Even though it might seem extremely useful, you should be careful with it because it might not be as decent as it might seem. It is known that this browser add-on works on Mozilla Firefox only; thus, do not be surprised if you notice its extension added on your browser. You should definitely use this program carefully because it seems rather suspicious, which is why you should erase it if you notice that it acts somehow unacceptably. Even though Weatheritup might not seem as unwanted software, the specialists of pcthreat.com have implemented a research and found out that this application might be closely related to Jollywallet, which is a considered to be an adware (advertising-supported application). Actually, it is very likely that Weatheritup is even based on the same engine as Jollywallet. Thus, it can be suggested that it might act somehow unnaceptably. 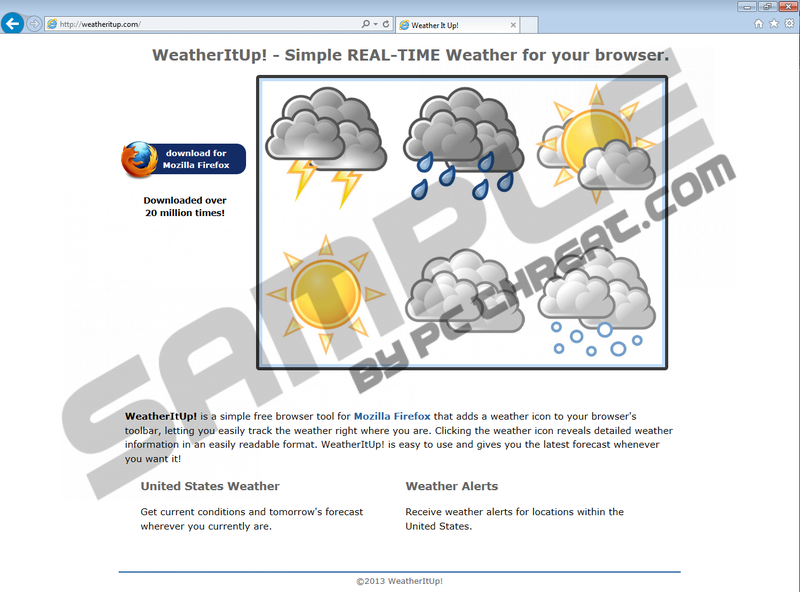 You should also know that Weatheritup will add an icon to your browser’s toolbar and you will be able to check the weather forecast by just clicking on it. However, it has been observed that the application might not work properly; some computer users complain that Weatheritup shows the weather forecast of entirely different location. If you notice this as well, you should better erase the program from your system because there is no point in keeping it. It is also better to erase it if you have downloaded the program from any random source on the web because it might be bundled with undesirable software. It is not obligatory to erase Weatheritup from the system because it is not a serious threat; however, if you notice that it acts strangely or does not show weather forecast as promised, you should definitely remove it from the system. Follow the instructions below and you will be able to do that easily and quickly. If you refuse to do that, you should know that this application might keep connecting to the internet without your permission. In order not to install suspicious applications in the future, you should definitely acquire a reliable antimalware tool and keep it enabled 24/7. We believe that SpyHunter is the most suitable tool if you want to protect your system. Launch your browser and tap Ctrl+Shift+A simultaneously. Located the undesirable extension and click on it. When you access the Chrome menu, move to Tools and then click Extensions. Click on the extension that you wish to erase and then click the recycle bin button. Quick & tested solution for Weatheritup removal.